Home » Delhi » “Dog! I Shall Drink Your Blood!” – Hauz Khas Kitsch! “Dog! I Shall Drink Your Blood!” – Hauz Khas Kitsch! No, I haven’t turned into a canine hunting vampire overnight! You have to admit this is a brilliant illustration. No we didn’t buy that T shirt. Here is more kitsch from Hauz Khas, a chic bohemian ‘village’ in South Delhi, that is sadly, fast degenerating into an overcrowded suburb. Shall reserve photos of the beautiful archaeological complex and the reservoir that it derives its name from, for another day. Wishing you all much joy, for Christmas and the coming year! 😀 I would courier it to you if I could. Thank you Christine. It certainly was a fun day. Not least because of the company of dear friends. Thank you Ruth. I enjoy reading yours just as much. We like bohemian! All the best og joy and happiness wishes for you too, Madhu! You might be surprised by how much of that is in the Oxford English dictionary 😀 Thank you for stopping by Eric. Have been missing my FG fix. Shall be over in a little while. 🙂 I would have taken a risk and let R wear that shirt 😀 (my hubby’s name also starts with R :D) Thank you very much, Madhu. Wishing you peace and joy – we have already discussed the yellow colour and it is the colour of Thursday according to Hindu – right? I didn’t want him getting beaten up by someone who took offence Paula! 😀 Oh yes, the colour was serendipitous! Thanks Paula. Loved your ice maiden too. No 😦 And R hasn’t let me forget it! I really like what someone painted on their front door. Unusual and colourful. Nice shots Madhu. Sholay is funny by the way. I’ve seen it twice. It’s a shame to hear that Hauz Khas is ‘fast degenerating into an overcrowded suburb’. The population in India is just growing too quickly. Thank you Cardinal. Sholay had some legendary dialogues that you could write a whole thesis on!! And yes, our cities are bursting at the seams. Rural employment is the need of the hour. Love the colors, but the shot of Scooter Art caught my eye the most. 😆 @ buying the shirt. Wonderful images of great colors that made me smile. Joys in the days ahead for you as well! The dog looks happy enough at the prospect! Christmas best wishes to you all Madhu! The tee shirt is nice – most people would not know what the message meant, except my Indian colleagues! When my friends lived in Windsor (not HRH Queen Elizabeth and Prince Phillip who also live in Windsor!) I used to visit twice a year and once when we were outside Windsor Castle when we heard a bit of a commotion. Turned out a Bollywood film was being made and a lot of English extras were singing and dancing. Have a nice Christmas – with the celebration of birth of Christ, I hope His message of peace and love helps those who live in terrible conditions because of natural disasters, wars etc and gives them hope. Thank you Jane. A very merry Christmas to you too! Madhu you are so funny! Ha ha 😀 Looking forward to the archaeological pics! As always you have provided another colorful post .. and this time around a yellow T-shirt .. 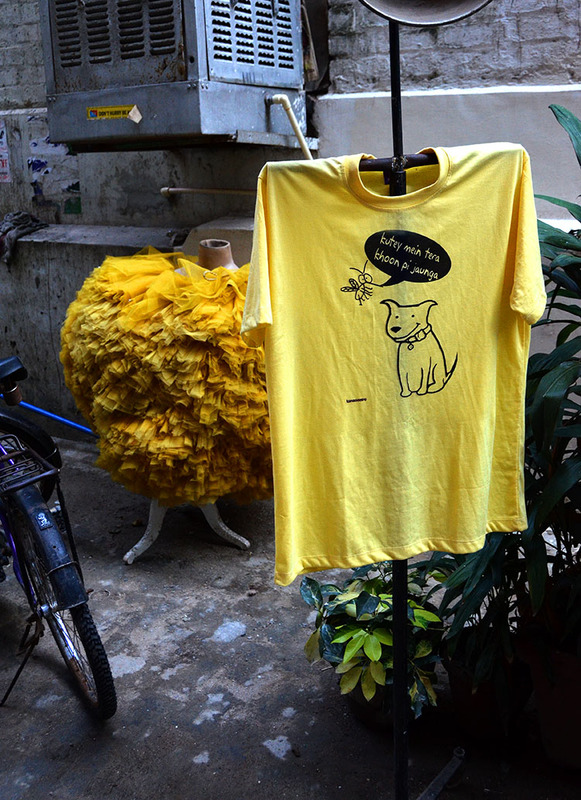 I would have bought that T-shirt myself, just for fun … yellow isn’t really my color – but I could have wore it while cleaning. Love it. Well spotted. Like the shopping totes too. Thanks for bring color into my grey Friday. Hehe I love that T-shirt design! Great photos! That’s a pretty old quote. Has stood the test of time. Happy travels, happy holidays, happy new year. Haha I don’t think I would have been able to stop A from buying that t-shirt! I loved the cool kathakali God pic.